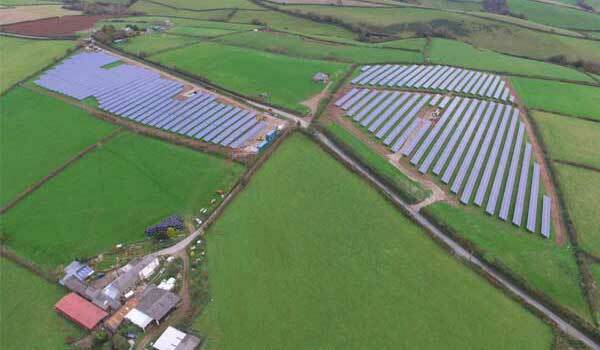 After 8 weeks of building and installing, this 3.8 MW solar farm near Kingsbridge was connected last week, and will now provide clean energy for a further 950 homes. Slade Farm is a 24 acre site, across 2 fields. As part of the planning requirements, in order to limit the impact of the development when seen from the surrounding area, we planted new hedgerows and added new plants to existing hedgerows. This both enhanced the landscape and provided new and improved wildlife habitats for the local bird and bat population. A further requirement was to ensure the external walls and roofs of the substation building, the switchgear housing and the proposed security fence were all of a suitable colour to ensure minimum visual impact. For this we organised special paint with the manufactures, and had them paint most of the equipment before it landed at site – something we normally do at site. This speeded up the entire process and ensured that the site was camouflaged as much as possible from day one. We are very excited to connect this site, because this means that PS Renewables has now designed, built and installed 20 utility scale solar farms throughout the UK, providing renewable energy for over 36,000 homes.